I have more than just the best caribou recipes, check out more wild game recipes at the end of the page. 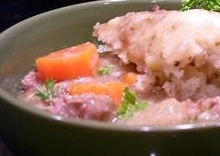 The first of my caribou recipes produces a savory and hearty stew. Add beef broth to your liking. Less for a thicker stew and more to be more of a soup. The dumplings make the dish. Nothing like a little boo for dinner. Heat oil in a heavy skillet. Toss the meat with flour, and carefully add to the skillet with the onion. Season with the garlic powder, onion powder, salt and pepper. Brown on all sides of the meat well and make sure the onion is translucent. De-glaze the pan with the red wine, and add the worcestershire sauce and balsamic vinegar. Add the beef broth; simmer for an hour. Sift the dry ingredients. Add the egg and milk. Stir and drop by spoonfuls into stew. Keep covered for 5 minutes, then uncover and boil several minutes longer. Serve immediately. My next caribou recipe is a family favorite. PREHEAT oven to 375 degrees. Spray a casserole dish with vegetable oil; set aside. Heat a heavy skillet and add the butter. Add the ground meat and onion; season with garlic and onion powder. Drain and place in the bottom of the prepared casserole dish. Sprinkle the peas over the cooked meat and spread the condensed soup on top evenly. Arrange tater tots over the soup and bake for 35 minutes, covered. Uncover and bake for another 20 minutes. 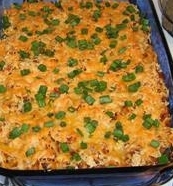 PREHEAT oven to 350 degrees and grease a 1-1/2 quart casserole dish. Brown meat and onion over medium heat. Drain and add the beef broth, taco seasoning and tomato paste. Mix well and bring to a boil. Reduce heat and simmer for 20 minutes. Add macaroni, chilies and 1-1/2 cups cheese. Pour mixture into prepared baking dish and sprinkle with the remaining cheese. Bake for 30 minutes or until heated through and cheese is melted. Top each serving with chopped green onion. This wonderful caribou recipe is a cinch to make and tasty too. Brown onion and meat in skillet with butter. Add tomatoes and season with salt and pepper. Cook until it thickens a bit. PREHEAT oven to 425 degrees and grease a casserole dish; set aside. After the meat mixture is thickened, pour into the prepared baking dish. Top with biscuits and bake for 20 minutes. Mix and sift dry ingredients. Cut in butter and add milk. Mix thoroughly. Pat out and cut into biscuits. I offer so much more than caribou recipes. Check out the navigation bar on the left. PREHEAT oven to 350 degrees and spray a casserole dish with vegetable oil; set aside. Mix ingredients together, form into a roll and place in the prepared baking dish. Lay slices of bacon over the top and bake for 45 minutes. Cook until thick. Pour around the roll and serve. I have more than just caribou recipes, check out the links below.